Southside Boxing Club's Jack Loew has been a busy man in recent weeks, doubling as a trainer as Alejandro "Popo" Salinas has resumed workouts and a matchmaker attempting to put together the most competitive card he can for his annual Season's Beatings event. 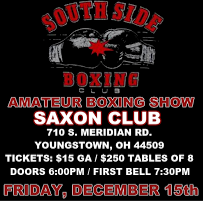 With the final preparations being made, I can tell you that from what I've seen, Youngstown will be in for a treat this upcoming Friday night at the Youngstown Saxon Club. Youngstown Boxing News will have you covered this week with the matchups as they become available and interviews. Tickets for the scheduled 15 bout card will be available at the door for $15.00. The doors at the Youngstown Saxon Club located at 710 South Meridian Road will open at 6:00 PM with the first bell slated for 7:30 PM. Stay tuned for more information and check back on Friday night for a full recap and post-fight interviews.